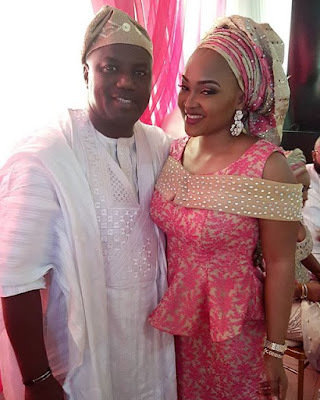 Aigbe, who is currently in her second marriage, got hitched to popular hotelier, Lanre Gentry, also on the same tally. Speaking in an interview the actress stated that her successful marriage is down to having a focus. "It has been cool and it’s been God all the way. Before I got into it, I had actually made up my mind that come what may, I was going to stay married." "Although, I won’t say there weren’t some challenges along the way, I am just being focused. And I have been praying about it and God has just been helping me. So, it’s been God all the way." For her husband, Lanre Gentry, it was not an easy task getting the woman's attention. He reportedly had to pay a huge sum of money before getting Aigbe's consent for marriage. He narrated an incident where he promised to pay a lady the sum of N50,000 so that she can convince the actress to talk to him. According to Naij News, “On getting there, I met one lady, Bimbo. I was inside my car. Bimbo called her out. She refused. I now told Bimbo to talk to Mercy, that if she agrees I will give her N50, 000", he said.